Silver dollar eucalyptus, known botanically as Eucalyptus polyanthemos and also commonly as silver dollar gum or red box tree, is an evergreen that grows in temperate and subtropical climates. Hardy only in USDA zones 8b through 11, it grows rapidly and is prized for its matte gray-green to blue leaves and upright round shade canopy. The leaves are round to oval and reach roughly 2 1/2 inches in diameter. The trees flower in white during the winter and produce fruits and seed pods in the spring and summer. 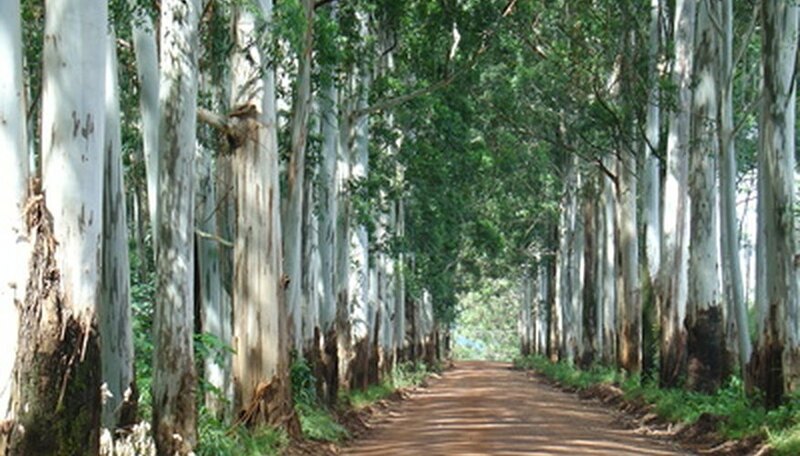 Silver dollar eucalyptus thrives in full sun and easy-draining soil and should be protected from heavy wind. Pruning is focused exclusively to establish the form in young trees, remove damage or dead tissue in mature trees, and to prevent entanglement in utility lines or other structures. Prune your silver dollar eucalyptus for form, shape or size in the spring after winter flowering has finished. Prune damaged or diseased limbs when you see them anytime throughout the year as needed as they can readily drop from the tree, causing injury or damage when allowed to remain in the canopy. Establish a strong and healthy tree structure by pruning trees 3 years old and younger each year to remove all lateral branches and water sprouts on the bottom half of the trunk. Cut the tips of branches back by 4 to 10 inches each year to encourage new branching and leafy fullness in the crown. Prune away cracked, diseased, dead or otherwise weak branches down to a point of healthy tissue and/or the parent branch, placing the cut just slightly outside of the branch collar. Pull the cut branches carefully from the crown and soil surface and discard, chip and compost or dry for burning. Remove any branches or foliage that interfere with utility lines, home roof lines, other structures or other tree canopies. Cut only what tissue is necessary to alleviate the problem. Follow the natural form of the canopy with your pruning cuts to re-create an attractive and balanced canopy.